China raised their reserve requirement ratio today for the third time this year and the ninth time since the beginning of 2010. I don’t have time to write much about this but I want to point out that Chinese is having a diminishing impact on the market. 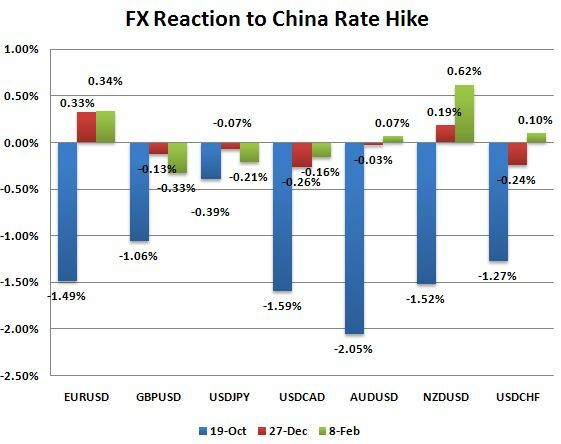 With each Chinese rate hike, there has been a smaller and smaller impact on the currency market. The first rate hike back in October elicited the biggest reaction because it was the first rate hike in nearly 3 years. At the time, all of the pro-cyclical currencies plunged against the U.S. dollar with the euro falling 1.5 percent and the Australian dollar declining by more than 2 percent. When China raised rates again on Dec 27th, the euro ended the day slightly higher against the U.S. dollar while the Australian dollar remained unchanged. The price action today is very similar to December which suggests that investors are skeptical about China’s ability to tame their roaring economy. Slower Chinese growth is undoubtedly negative for global growth but we have been down this road before and even though there have been signs of slower growth in the Chinese economy, it has not had a significant impact on demand. The Reserve Bank of Australia for example has recently attributed their rosier outlook to a strong Chinese economy. Unsurprisingly, rising inflationary pressures is the primary motivation behind China’s rate hike. We have been looking for another rate hike from China since they tightened in December and with prices rising due to geopolitical risks, the Lunar New Year and a recent drought in the grain producing Northeast part of the country, China did not want to take any risks, opting to preempt a further increase in inflationary pressures by raising interest rates. Given the health of the Chinese economy and the prospect of stronger global growth, we have not seen the last of China’s policy actions. We expect more interest rates hikes and more reserve requirement ratio hikes in 2011. Although these actions will drive the Chinese Yuan higher, if global growth is supported by other countries around the world, it will soften the blow of Chinese tightening.